It gets dark at 3:30 p.m., it’s either raining, or freezing, and sometimes it’s doing both. Every day looks the same because every day looks like you just stepped out of your house and walked into The Road. It’s seasonal affective disorder. And it’s enough to make you fire up the Leonard Cohen and pull the covers over your head. NBA players, despite their seemingly enchanted lives, are not immune to the emotional perils of winter. Compound the blues that go along with the first few months of the year with the fact that this highly compressed season is harder on their physical and mental stability than any other year in recent memory, and it’s no surprise that we’re seeing a few guys start to crack. Let’s dip our heads into the waiting room and see which NBA players are waiting to see their shrinks. Raymond Felton is familiar with pressure. He’s played for Roy Williams and George Karl and dealt with the glare of the New York spotlight as a Knick. But apparently nothing — not even winning an NCAA national championship — prepared him for the emotional gauntlet he would run in the Pacific Northwest. Felton is not getting along with Trail Blazers coach Nate McMillan, and it’s bringing him down. “Never in my days playing basketball, have I felt like a coach wasn’t confident in my abilities. 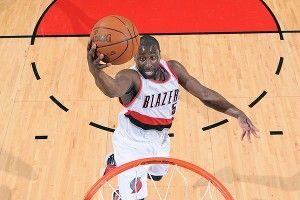 It’s hard to play knowing that,” Felton recently said. Things have gotten so bad for Felton that he has turned to the only person he feels like he can trust. “It’s to the point where the only person I could turn to was my mom,” he said. “She knows how I feel and how much I’m trying to turn this thing around and she just helps me put things in perspective.” Kind of an intense thing to reveal to the media, Raymond. But this is about sharing, and through sharing we gain understanding. OK! Next! Forever I love Atlanta. It’s just too bad the guys on the Hawks don’t. Things were going so well for the Hawks earlier this season, but, according to reports, Kirk Hinrich’s return has thrown off the delicate balance of Larry Drew’s rotation. Added to which, Marvin Williams apparently wants a one-way ticket to Somewheresville, Not Ga. “Sources” say Williams is unhappy with his numbers and his role in the offense. Sounds like Raymond and Marvin might need to get into some kind of Tar Heel recovery group together. Strength in numbers! I suppose it’s only fitting that the biggest concentration of winter blues would be coming from a place that you don’t associate with winter at all: Los Angeles. Word around the campfire is that Jerry Buss’ son, Jim, has, in CBS’ Ken Berger’s words, transformed “a great franchise into a steaming pool of nepotism and nincompoops.” And you know what they say — when the going gets tough, Kobe gets very Kobe-like. Bryant has become vocal about the need for the Lakers’ front office to trade Pau Gasol or get off the pot, as the constant rumors about the forward’s future are starting to impact his play. “I wish management would come out and either trade him or not trade him,” Bryant said. As is usually the case with the NBA, the best stuff isn’t on the record. The best tidbit from Berger’s piece cites a person with ties to the Lakers saying, “Kobe is exploding.” Duck and cover, people. Winter is here.